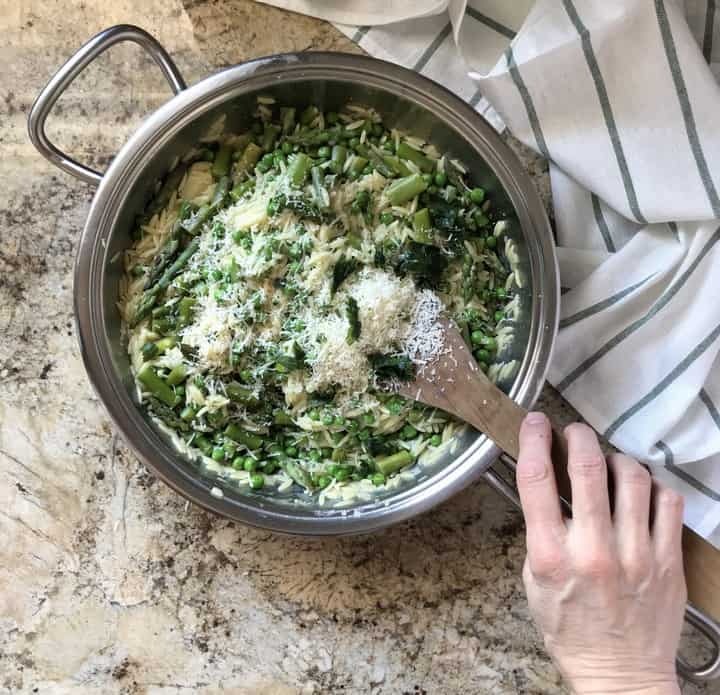 The addition of peas and asparagus to this Orzo Risotto creates a refreshing and healthy side dish that complements any weeknight dinner. A quick and easy accompaniment to make today! 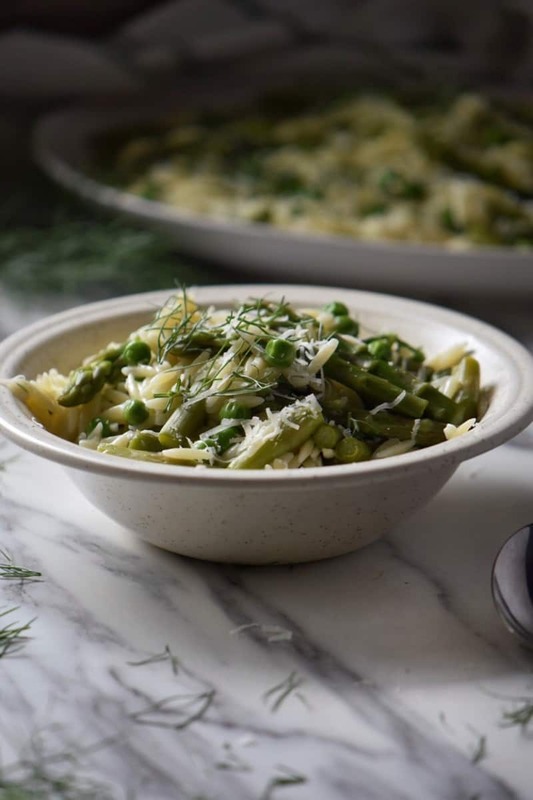 Nothing says spring like asparagus and peas! There is definitely no shortage of recipes when it comes to seasonal produce. 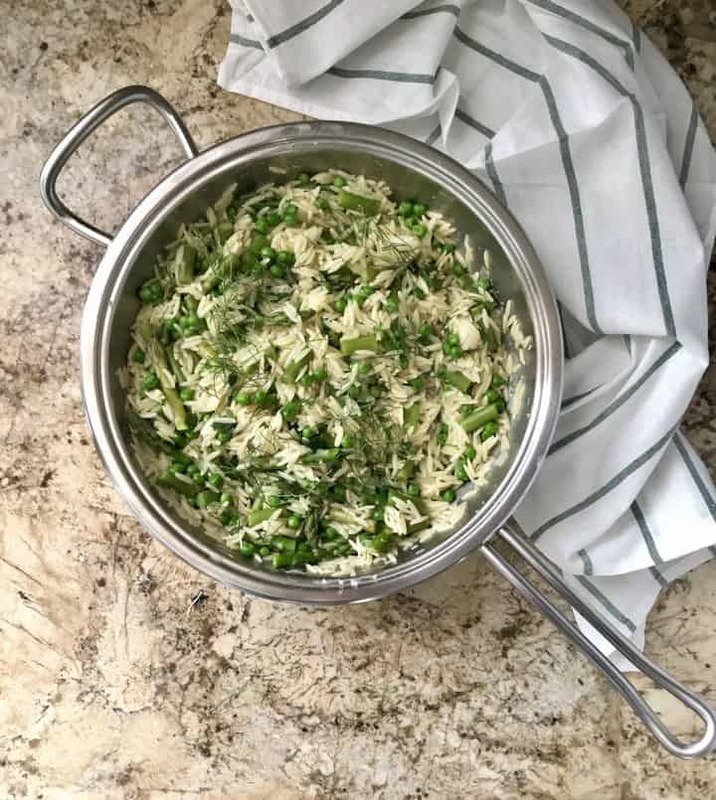 Truth be told, there is nothing better than using spring vegetables to make this orzo side dish. Although, it can be difficult to find fresh peas, frozen peas are a wonderful alternative any time of the year. Just like this recipe for Quick Pasta Risotto, this pasta side dish is ready in less than 20 minutes. 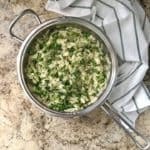 What do I need to make Orzo Risotto? Olive oil. Just a drizzle. Shallots. Milder and sweeter than the average onion. Vegetable or chicken broth. Homemade or low sodium. Orzo. A small shaped pasta. Asparagus. Whenever possible purchase local. Peas. Fresh or frozen peas are perfectly acceptable to use in this recipe. Cheese. Parmesan, if you have. Parsley. Italian flat leaf if possible. As far as kitchen accessories are concerned, you need a large pan, one pot, a wooden spoon and a steamer basket. A knife and a wooden board will come in handy to chop the shallot, asparagus, parsley and fennel fronds (if using). Over medium high heat, drizzle 1-2 tablespoons of olive oil in a large pan. Add the finely chopped shallots and 2 cloves of garlic. Saute for about 1 minute. Add the vegetable (or chicken) stock (2½ cups) and bring to a boil. 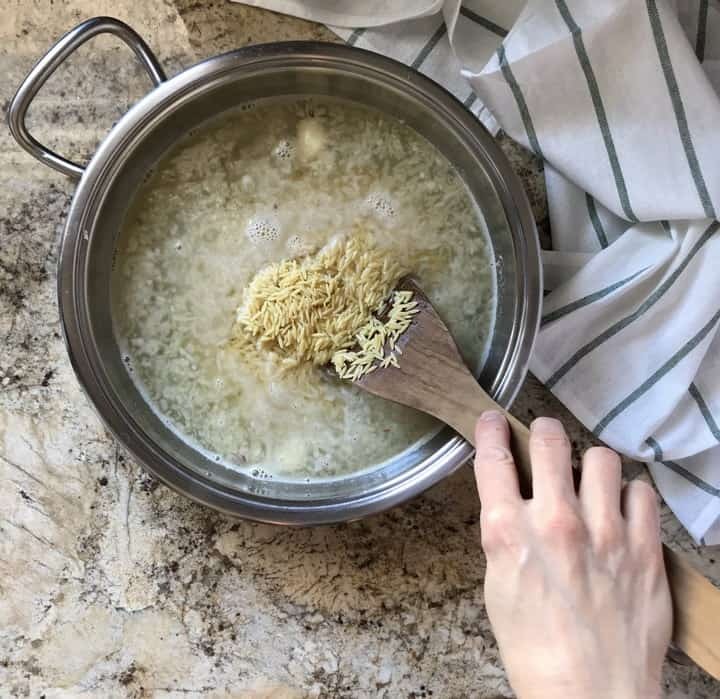 Add the orzo pasta (1 cup) and simmer on medium-high heat for about 8-10 minutes or until most of the liquid is absorbed and the orzo obtains a chewy texture. Stir occasionally to prevent it from sticking to the bottom of the pan. The orzo is still a bit “wet” at the end of the cooking time. This slight moisture will be reabsorbed with the addition of the rest of the ingredients. While the rice shaped pasta is cooking, rinse the asparagus. Trim the ends and cut the asparagus in ½ inch pieces. Set apart the asparagus tips as they take less time to bake. In the second pot, insert the steamer basket and bring the water to a boil. Add the asparagus pieces and steam for 2-3 minutes until tender crisp. Add the asparagus tips and frozen peas (1½ cups) and cook for a few more minutes. When vegetables are cooked remove from heat. When the orzo is cooked, add the vegetables to combine. Off the heat, stir in the Parmesan cheese (1/3 cup) and chopped parsley (2 tablespoons). Taste for seasonings and plate. If desired, garnish with fennel fronds and serve immediately. Separate the asparagus tips from the stems as cooking times are different. The orzo cooking time is between 8-10 minutes. Stir occasionally to prevent the orzo rice from sticking to the bottom of the pan. Use fresh Italian flat leaf parsley to bring out all the flavors. Add cooked lentils to make this side dish a complete meal. This simple orzo recipe was inspired by a recipe I found in the Italian Issue of a Jamie Oliver magazine. Here are some of the changes I made: I added shallots and garlic; I increased the amount of vegetables used and I replaced the butter with olive oil. The recipe also called for mint which I replaced with fennel fronds. This is such a versatile recipe. Once the orzo is cooked, you can add almost any cooked vegetable for a great tasting side. You can also add cooked lentils or chickpeas and it becomes a complete meal! 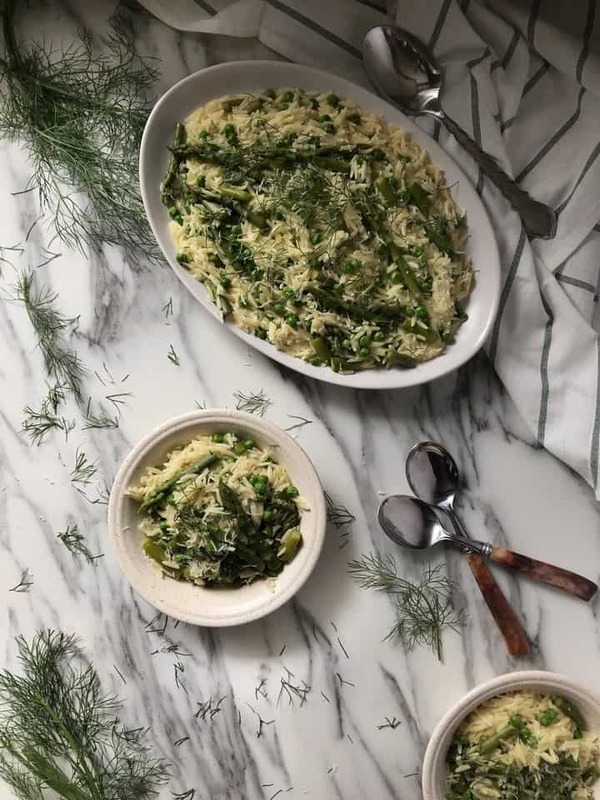 ★★★★★ If you have made this Orzo Risotto recipe, I would love to hear about it in the comments below and be sure to rate the recipe! Drizzle 2 tablespoons of olive oil in a large pan over medium high heat. Add the shallots and 2 cloves of garlic. Saute for about 1 minute. Add the orzo, stir and simmer on medium-high heat for about 8-10 minutes or until most of the liquid is absorbed. The orzo is done when a chewy texture is obtained. Stir occasionally to prevent it from sticking to the bottom of the pan. Meanwhile, rinse the asparagus. Trim the ends and cut the asparagus in ½ inch pieces. Set apart the asparagus tips as they take less time to bake. In a separate pot, insert steamer basket and bring water to a boil. Add the asparagus pieces, cover pot and steam for 2-3 minutes until tender crisp. Add the asparagus tips and frozen peas and cook for a few more minutes. When the vegetables are tender, remove from heat. When the orzo is cooked, stir in the vegetables. Off heat, add the grated Parmesan cheese and parsley. Combine together. Plate to serve. If desired, garnish with fennel fronds. Stir occasionally to prevent the orzo from sticking to the bottom of the pan. I have a feeling this is going to become one of my favorite sides! Looks delicious. I hope you get a chance to try this easy recipe for Orzo Risotto. Enjoy! What a great side! This will go with any protein or by itself!